How Much Compensation Can I Claim For An Accident In An Office? The vast majority of shops and office buildings in the UK are safe places in which to work. This is largely due to the wealth of workers’ rights legislation which has been added to UK laws over the years, including the right to a workplace which is free from hazards. Employers of all types are obliged to take workplace safety seriously and there can be very severe penalties for not doing so, up to and including time in prison for company owners found guilty of the very worst types of negligence. In the UK, there is a department of the government which is effectively a police force for workplace safety: the Health and Safety Executive (or HSE). In short, the combination of Britain’s laws, its HSE, and a culture of accident prevention means that it is one of the safest countries in the world for workplace safety. In spite of this, accidents do still happen. Thanks to data collected by the HSE, insurance companies, and employers, we can get a very detailed picture of just how many office accidents there are each year, what types of accidents are occurring, how severe the injuries are, how many working days are lost, and so on. This information is then used to modify and improve existing safety legislation and workplace regulations so that a culture of continuous improvement flourishes. For those who have suffered a personal injury in a shop, it is these regulations which will prove essential to a compensation claim. As accident compensation claim specialists, we have both the experience and the legal expertise to advise you and to represent you in your claim. We have helped hundreds of clients to win compensation claims for accidents and injuries sustained at work and we can help you. Making a claim against a shop may be easier than you would think, once you have the support of an experienced team of legal professionals. Office Accident Legal Advice Video Can I Claim? Health & Safety statistics and facts are published regularly by the UK Government if you would like more detailed information. A guide to office accident and injury claims. Who is responsible for safety in an office? Is the employer liable for an office accident claim? Is the office occupant always at fault in an accident claim? How do accidents in an office happen? 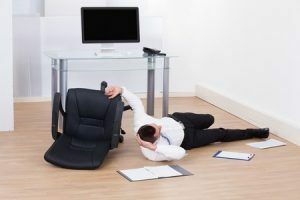 What to do if you are involved in an accident in an office? Claiming compensation for an injury in an office or shop as a member of the public. How to begin an office accident compensation claim. What can be claimed for after an accident in an office? How much compensation will I get for an accident in an office? No win no fee office injury claims. Why choose us as your claims service for an office accident claim? In this guide, we will provide you with background information that will be useful for you if you are considering making a claim for an accident in a shop or office. We will be focusing on a variety of relevant topics. However, because every accident and injury is unique, not all of the topics covered may be relevant to your individual case. That’s why it’s so important for us to speak to you individually about the unique circumstances of your accident. The service we offer begins with this fact-finding session, which is usually conducted over the phone. Typically, we would collect all of the necessary information about your accident within a single session and, once we have all the details, we will be able to advise you as to whether we think you have a chance of making a successful claim. In most cases, we will offer to represent you on a ‘No Win No Fee’ basis. This means that you will have legal representation for your claim without the big legal bills: you won’t have to pay us a penny unless we are successful in winning a compensation award on your behalf. We do understand that being injured at work is a highly stressful ordeal and we aim to keep our question-and-answer session as short and stress-free as possible. We have many years of experience in this business and you can count on us for advice and support at every stage of your claim. We have included within this guide a table a compensation payment award table which shows historical amounts paid for certain specific injuries. If you have any further questions about your case, you will also find information in this guide about how to contact our offices. The main piece of legislation covering workplace safety in the UK is the Health and Safety at Work Act of 1974 and its various amendments. It places a duty on all employers “to ensure, as far as is reasonably practicable, the health, safety and welfare at work” of all their employees. Sub-contractors, visitors, and even members of the public, who are also included within the scope of the Act. Even those who are self-employed or perhaps working indirectly (for example, through a temp agency) enjoy the same rights, although the process of making a claim against the responsible party may differ. The occupier or employer also faces the same duty of care towards members of the public and visitors. For example, if you have been injured in a shopping centre, it may be the centre’s management company who is responsible for maintaining a safe environment for its customers. If the accident occurred in a shop within the shopping centre then – in most cases – it will be the shop’s management who is the responsible party. Always remember to ask for the accident book; reporting an accident in a shop immediately after it occurs will greatly assist us in making a claim for you. Even if you did not get the accident recorded at the time, please do get in touch with us. Shop accident compensation amounts can be higher than you may think. Accidents often occur when maintenance work is taking place. Employers frequently need to remodel parts of their office building but they need to keep their business running at the same time. If you’ve suffered an injury related to refurbishment or maintenance work which was taking place at your office, both the building occupier and the contractor who was carrying out the work have shared duties. In other words, they need to have worked together to produce a plan to carry out that work in a safe manner. If either party has failed to ensure that the work was done in a safe manner and according to the safety plan, you may have a strong case for compensation. In addition, offices need to be kept clean. Many of the cases which we pursue are claims for slipping on wet floor surfaces. The building’s occupier and the contractor are obliged to work together to produce a plan to ensure that the cleaning work can be done without endangering workers and visitors. If you are interested in the responsibility for an accident as it pertains to your claim, feel free to contact our offices today. Carrying out a risk assessment to identify the specific hazards of the building or site. Eliminating or reducing hazards wherever possible. Providing safety equipment, fire drills, and trained ‘First Aiders’. Providing ongoing staff training on safety matters. Keeping records of accidents (the “Accident Book”) and dangerous incidents (“near misses”) and reporting these to the HSE as required by the RIDDOR Regulations. Having a written company health and safety policy and a “management plan” which sets out who in the company is responsible for making sure the plan is implemented. To win a compensation claim, we usually need to prove negligence on the part of the employer or building occupier. In other words, we need to show the court that the employer has failed in his duty of care towards you. Every accident has its unique causes and circumstances and the employer or premises occupier is by no means automatically responsible in every case. However, as you can see from the list above, UK law places some very serious obligations on employers to keep building users safe. If there has been negligence or perhaps a relaxed attitude towards safety matters which led to your accident, you may have a very strong case for financial compensation. In most offices and shopping centres, there are usually a host of other companies working alongside the main occupant on a daily basis. In the past, large corporations directly employed their own reception staff, security staff, cleaning staff, and canteen staff but that has changed in recent years. These days, many large companies find that it is cheaper to use independent specialist sub-contractors to provide these types of service within the building. Often, there will also be a Facility Management company as well, often called FM companies for short. As the name implies, they are contracted by the building occupant to take care of the building itself and often they co-ordinate the security staff, the cleaners, and so on. This leaves the main employer free to concentrate on their business. FM companies often bear the responsibility for accidents and injuries because looking after the building is their primary role. All of these different companies working on the same premises can cause complications for an accident compensation claim. Things can get particularly tricky when accidents occur during refurbishment work which is being carried out in an office which is still occupied. Sometimes, the claims court will decide that more than one party bears responsibility and they will be required to share the costs of compensating the victim. Other cases are more clear-cut. If you’ve slipped on a wet floor and the cleaning contractor forgot to provide the usual warning signage, proving who was negligent – and why – will be much easier. How much compensation for slipping on a wet floor will depend on the severity of the injuries and the level of negligence. Whatever may be the case in your individual circumstances, you can rely on us to do the necessary homework to establish which party or parties were negligent and to bring your compensation claim to a swift conclusion. Injuries resulting from slips, trips, and falls make up the majority of compensation claims. The HSE estimates that there were 119,000 such cases in 2015/16, making up about a third of all reported injuries. Slip and fall compensation amounts may be higher than you would think, so if you’ve been injured in this way then please contact us today. Trailing electrical cables obstructing walkways. Boxes, rubbish, and clutter left lying on the floor. Damaged carpets and floor power outlet boxes which have been left open. Spillages on hard floors and poorly marked wet floors following cleaning. People climbing on furniture, especially during the Christmas period. A second significant category of injuries are those caused by manual handling: lifting and carrying objects around the office. Employers are legally bound to provide training and specialist equipment for workers who are regularly required to lift heavy objects. There is also a high number of claims for injuries resulting from electric shocks and burns. These are often caused by faulty electrical appliances and the burns from kettles and microwave ovens. Another category of claims results from repetitive strain injury. Anyone who is obliged to carry out a physically repetitive task at work can be a victim. In office environments, this commonly affects workers who spend most of their day typing at a keyboard. It can be extremely painful and have long-term effects. As with other types of workplace hazard, employers are obliged to take steps to protect you. For example, by providing keyboards with wrist support and by ensuring sufficient rest periods are provided. It may be possible to claim for existing injuries that have worsened as a result of an office accident. For example, an employee with a visual impairment may be able to make a claim if they are forced to sit at a computer screen for long periods and their condition is made worse. Successful claims have also been made by those with pre-existing back problems who are not given a suitable chair to work in. First and foremost, every accident should be reported. All employers are obliged to keep an Accident Book and all accidents (even apparently trivial ones) should be written down in the book. Employers are also bound by the RIDDOR regulations, which mean that certain types of accidents are dangerous occurrences and must be immediately reported to the Health and Safety Executive. It’s also worth taking a few photographs with your smartphone if you think that somebody else’s negligence has caused your accident; these could turn out to be highly valuable evidence as your claim progresses. Getting the names and contact details of any witnesses is also highly recommended. Employers and building occupiers don’t only have a duty of care towards employees; they are also obliged to keep the general public safe. Sometimes, members of the public can be injured on or near company premises, for example, by being struck by delivery vehicles. If you find yourself asking, “I got hurt in a retail store, can I make a claim?” The answer is – typically – yes. As long as we can show that the store owner or management failed to take reasonable steps to prevent your accident, you have a good chance of making a successful claim. What type of accident, where, when and how did it occur? What injuries you suffered at the time and if there were long term effects. What type of medical treatment was necessary (please note that we can arrange a local medical for you if appropriate). Was the incident recorded in an Accident Book? Were there witnesses? What do you think caused your accident? Was somebody’s negligence the cause or a contributory factor? Once we have established the basic facts, we will be in a position to advise you on whether we think you have grounds for making a claim and, in most cases, we will offer to represent you on a ‘No Win No Fee’ basis. General damages – for pain, hardship, mental anguish and so on. Care costs – if you need help as a result of your injuries, even if that help is provided by an unpaid family member. Loss of earnings – if you have been unable to work because of your injuries. Travel Expenses – incurred as a result of your accident. Medical Expenses – incurred as a result of your injuries. Speaking to a legal expert can help you determine the full extent of your compensation claim. Every case that we take up is unique and compensation payments will depend upon the individual circumstances of your accident. Shown below are guideline amounts that have been paid to claimants in the past. The variance in the printed figures means that different amounts have been paid out depending on the severity of the injury. For example, if you would like to know how much compensation for slipping on wet floor, this table can provide a rough estimate based on the severity and type of your injuries. Brain damage (less severe) £1,675 to £9,700 Compensation awards depend on effects on concentration, memory, cognition, and sensory impairment. Brain damage (severe) £166,500 to £214,350 Including partial paralysis. Please note that payments for lost earnings, medical, and travel expenses are dealt with on a case-by-case basis depending on your unique circumstances. In the past, to get a solicitor to help you to claim compensation for an injury, you would have needed to pay right from the initial consultation. And – as we all know – legal bills can be expensive. If you lost the case altogether, you would still be required to pay your solicitor for his time and expenses. For ordinary working people, this makes claiming way too risky. We believe that our ‘No Win No Fee’ arrangement offers people a fantastic way to access the legal profession. It means exactly what it says: if we don’t win your case for you then your bill for our services is zero. If we do win the case, then our fees will be taken from the amount of compensation that has been awarded by the court. There really is nothing to lose, so contact us today. We are one of the UK’s best injury compensation claims specialists with years of experience in the field. We got to where we are today by offering a client-centred approach. We always remember that our success depends on putting you, our client, first. We understand that suffering from any kind of injury is a terrible thing to happen to a person and that going through a legal process to seek compensation can be stressful. We see it as our duty to guide and support you through this process at every step of the way. We will always be on-hand, via telephone and email, and you can rely on us to give you the very best in terms of legal advice, ongoing support and customer service. It’s what we do best. Have you suffered an injury in an office or a shop? Have you had a slip, trip, or fall in a shop or an office? If you have been injured, we can advise you on whether you have grounds to make a claim for compensation. Whether you are an employee, a contractor, a visitor, or just a member of the public, we can help. Our service starts with a simple phone call. We will quickly be able to tell you whether we think your claim could succeed, how long it might take, and how much compensation you might receive. The phone call is a freephone number and completely without obligation, so you’ve really nothing to lose. Either use the contact form on our website to arrange a chat or call us now on 0800 073 8804. Have you had a slip or trip in the office or maybe a accident on a broken chair. For free legal advice contact us today to find out if you can claim compensation. Call us today for free legal advice.